You install ONE Smart Control on your current electrical circuit. You do not need any new cables or fuse boxes. 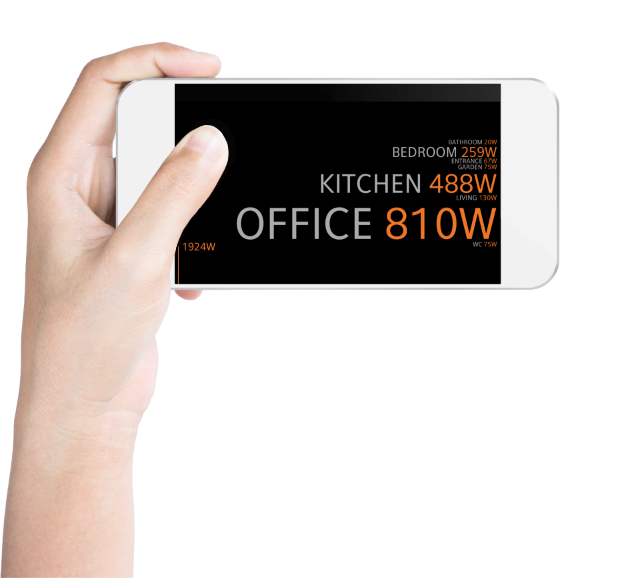 This makes the home automation system suitable for every home: new, renovated or an existing house. How does the system work? Simple: you connect the small converter blocks to the switch that you want to integrate. ONE Smart Control can be used in every home. 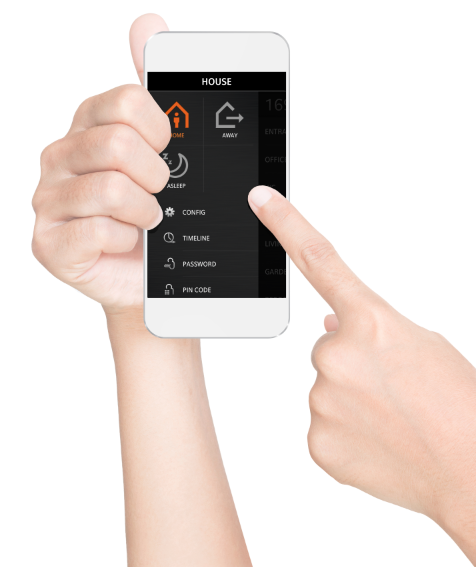 You can operate the ONE Smart Control automation system wherever you are, using your iPhone, iPod, iPad or Android smartphone or tablet. You are at work, and want to check whether the lights have been switched off? You want to lower the blinds during an unexpectedly warm and bright day? You want to monitor your energy consumption while you are away for the weekend? You ask, ONE Smart Control performs. You do not need to be an electronics expert to programme the ONE Smart Control system. Do it yourself and discover how simple, clear and easy our software is to use. Before you know it, all your devices are connected. And what if you are not happy with the result? In a few clicks, you can adjust the programme yourself, without the need to call your installer. You install ONE Smart Control on your existing or new, conventional 230 V mains. You do not need new cables or a fuse box. This makes the home automation system suitable for every home: new, renovated or an existing house. A handy overview of your energy consumption on your app means that you will always know exactly what device is using the energy and how much it is consuming. You can disable the devices immediately when required. Your original switches do not lose their function. When you enter the room, you can still turn on the light with a single press. You know how your system works. But other people also need to be able to operate the system. The babysitter, the cleaning lady and the children can continue to operate the switches in the same way as a conventional system. Also, you are free to choose your own design for the switches. Whether you live in an apartment, loft, house or villa. You can expand your system exactly the way you want. This flexibility allows you to expand in your own time, with additional features or whenever new rooms are added. Today, you only want to convert the living room or stairwell to a smart system? Or perhaps only the sockets used for the most energy-consuming appliances? Fine. And what, if at a later date, you build a pool house, start using an additional room or want to automate the garden lighting? It is up to you! And, when you move, you simply take the components with you. After an exploratory meeting, our consultant will give you a detailed and transparent budget, tailored to your needs. From the outset, you will know how much you will be spending on your system. There are no hidden costs. Downloading the app is free, and you can discuss the installation costs with your installer. Compared with other home automation systems, installing the ONE Smart Control is highly cost-effective. Every day, ONE Smart Control continues to innovate and build new functionalities. The integration of a home automation system is often synonymous with a huge cabinet full of electrical cables. ONE Smart Control has been designed to require only a minimum of extra space compared with a conventional system. Furthermore, all elements in the cabinet have been very thoughtfully fitted, using a sleek design to ensure that everything is outstandingly well-organized and clear. Every day, our developers work on optimizing, fine-tuning and expanding the products and software. This happens behind the scenes and, as a user, you will be unaware of this. Each time a new version is ready, you will receive a pop-up in your app, prompting you to give permission to install the new version. If there have been major changes, or if there are interesting new features, you will receive an overview of these by email. This way, you can take full advantage of the new features whenever it suits you.